Formerly from Divide, currently in Denver and moving to Grand Junction this summer (2014). I've just been cleared by the boss to pursue becoming a Sport Pilot , I had to give up sailing, diving, and shooting, sell the horses, hang up my spurs and do some dishes. No problem-o, I'm all in! 2014 is flight training and come 2015 it's time to pick my poison, the JA Highlander is at the top of my wish list. I'm ex-Navy (subs/sonar), former salvage diver and permanent gear-head. And somehow I found work as a software engineer. Looking forward to the journey and contributing to the sport! Quick update - in June-2017 purchased an awesome JA Highlander from Eastern Canada (builder Jack Leroux). 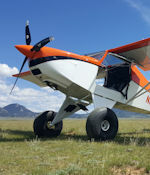 Had trailer custom built, drove from Colorado to Madawaska, ON, de-registered, loaded her up, crossed the border, drove back to Colorado, re-registered, new U.S airworthiness and into the air. The paperwork alone was a huge effort. If anyone is looking for guidance on U.S. import from Canada I have some experience. Been flying in the high country, South Park area (dirt strip near Wilkerson Pass) and made a long cross-country to Escondido, CA. Plane is super, may great hours ahead. Cheers!